All That You Can't Leave Behind is the tenth studio album by Irish rock band U2. It was produced by Brian Eno and Daniel Lanois, and was released on 30 October 2000 through Island Records and Interscope Records. Following the mixed reception to their 1997 album, Pop, All That You Can't Leave Behind represented a return to a more mainstream sound for the band after they experimented with alternative rock and dance music in the 1990s. At the time of the album's release, U2 said on several occasions that they were "reapplying for the job ... [of] the best band in the world". U2 brought back Eno and Lanois, who had produced three of the band's previous albums. The album was originally named "U2000", which had been a working title for their PopMart Tour. Although the band wanted to write new material before beginning recording sessions, Eno convinced them to quickly write songs in the studio. For three weeks in late 1998, U2, Eno, and Lanois recorded demos in Hanover Quay Studios. One of the few quality ideas that stemmed from these brief sessions was the song "Kite". Lead singer Bono's vocals inspired everyone in the studio, particularly after he had been suffering from vocal problems for the previous few years. U2 thought they would have a new record completed in time for 1999. After the band's brief demo sessions, The Edge worked alone on song ideas before the band reunited at Hanover Quays. They recorded with the mentality of a "band in a room playing together", an approach that led to the album's more stripped-down sound. The album was banned in Burma by SPDC because "Walk On" is a song that was dedicated to Burmese human rights activist Aung San Suu Kyi. The photograph on the album cover was taken by long-time U2 photographer Anton Corbijn in the Roissy Hall 2F of the Charles de Gaulle Airport in Paris, France. Unlike the busy colour sleeves of the band's 1990s records, the cover is a single monochrome image of the band in the airport's departure terminal. The designers describe the look they created as "grown up". Early versions of the cover released to the press show a departure sign that reads "F21-36", however, this was changed to J33-3 in reference to the Bible verse Jeremiah 33:3, "Call unto me and I will answer thee great and mighty things which thou knowest not." Bono referred to it as "God's phone number". The lyric "3:33 when the numbers fell off the clock face" appears on the song "Unknown Caller" from the group's 2009 album No Line on the Horizon. All That You Can't Leave Behind is easy to relate to, full of solid songs that appeal to a wide audience with its clear notions of family, friendship, love, death, and re-birth. ...the sounds on this album come from a band that has digested the music it started to consume while making Rattle and Hum. This time they are neither imitating or paying tribute. This time it's soul music, not music about soul. All That You Can't Leave Behind received favorable reviews from critics; at Metacritic, which assigns a normalized rating out of 100 to reviews from mainstream critics, the album received an average score of 79, based on 17 reviews. James Hunter of Rolling Stone magazine declared it "U2's third masterpiece", alongside The Joshua Tree and Achtung Baby. Steve Morse of The Boston Globe said the record "has great songs that tie together beautifully—a welcome change from the disjointed nature of U2 discs such as 1993's Zooropa and 1997's Pop". He believed that Bono took extra care in crafting the lyrics, resulting in the "most thoughtful, personal, and tender U2 songs in memory". In his review for The Village Voice, Robert Christgau felt that the album eschewed the artsier tendencies of U2's previous work in favor of hooky pop songs and stated, "The feat's offhandedness is its most salient charm and nagging limitation. If I know anything, which with this band I never have, their best." The Elevation Tour stage design was stripped down compared to the elaborate stadium sets on the band's previous two tours. It featured a heart-shaped ramp around the stage. ^ a b Tyrangiel, Josh (23 February 2002). "Bono's Mission". Time. Retrieved 10 March 2007. ^ "TOP 500 ALBUMS OF ALL TIME". Archived from the original on 15 January 2013. Retrieved 5 January 2013. ^ "All That You Can't Leave Behind". The 500 Greatest Albums of All Time. Rolling Stone. Retrieved 5 January 2013. ^ Quinn, Ben (16 July 2004). "French police still haven't found what U2's looking for". Irish Independent. Retrieved 5 July 2013. ^ "U2's Criminal Record". NME. 24 November 2000. Archived from the original on 9 October 2012. Retrieved 12 August 2011. ^ "U2 Paris, 2000-10-19, Manray Club, All That You Can't Leave Behind Promo". U2Gigs. Archived from the original on 28 August 2008. Retrieved 12 August 2011. ^ Lang, Nico (18 September 2014). "How U2 became the most hated band in America". Salon. San Francisco, California: Salon Media Group. Retrieved 18 September 2014. 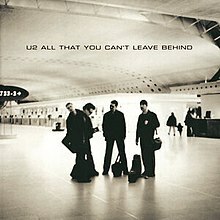 ^ a b "Reviews for All That You Can't Leave Behind by U2". Metacritic. CBS Interactive. Retrieved 10 March 2014. ^ a b Erlewine, Stephen Thomas. "All That You Can't Leave Behind – U2". AllMusic. All Media Network. Retrieved 28 December 2010. ^ Browne, David (3 November 2000). "All That You Can't Leave Behind". Entertainment Weekly (567). Retrieved 28 December 2010. ^ a b Sweeting, Adam (27 October 2000). "Pop CD of the Week: Time to get the leathers out". The Guardian. London. Retrieved 28 December 2010. ^ a b Long, April (28 October 2000). "Even Better Than the Surreal Thing!". NME. Archived from the original on 1 June 2010. Retrieved 28 December 2010. ^ DiCrescenzo, Brent (31 October 2000). "U2: All That You Can't Leave Behind". Pitchfork. Retrieved 17 August 2011. ^ Blake, Mark (December 2000). "U2: All That You Can't Leave Behind". Q (171): 116–17. ^ a b Hunter, James (26 October 2000). "Music Reviews: All That You Can't Leave Behind". Rolling Stone (852). Retrieved 28 December 2010. ^ a b Gundersen, Edna (30 October 2000). "10th album: A beautiful day for us all". USA Today. McLean. Archived from the original on 5 October 2016. Retrieved 3 October 2016. ^ a b Christgau, Robert (28 November 2000). "Getting Bizzy". The Village Voice. New York. Archived from the original on 10 September 2014. Retrieved 2 September 2014. ^ Morse, Steve (26 October 2000). "U2 leaves the present behind". The Boston Globe. Retrieved 28 December 2010. ^ Thompson, Stephen (30 October 2000). "All That You Can't Leave Behind". The A.V. Club. Retrieved 22 September 2018. ^ "The 2000 Pazz & Jop Critics Poll". The Village Voice. New York. 20 February 2001. Retrieved 30 July 2015. ^ Gallo, Phil (28 February 2002). "The Grammys: U2 and sharp keys; Soul star, Bono tops with 'O Bro'". Variety. ^ "100 Best Albums of the Decade". Rolling Stone. 9 December 2009. Archived from the original on 13 December 2009. Retrieved 17 October 2014. ^ "100 Best Songs of the Decade". Rolling Stone. 9 December 2009. Archived from the original on 13 December 2009. Retrieved 17 October 2014. ^ a b "U2 debuts at #1 in Canada". Jam!. Archived from the original on 4 July 2013. Retrieved 13 June 2013. ^ Hampp, Andrew; Halperin, Shirley (7 March 2014). "No U2 Album, Tour Until 2015 (Exclusive)". Billboard.com. Prometheus Global Media. Retrieved 7 March 2014. ^ Lang, Nico (18 September 2014). "How U2 became the most hated band in America". Salon. Retrieved 21 December 2016. ^ "U2 Elevation Tour 1st leg: North America". U2Gigs. Retrieved 12 August 2011. ^ "U2 Elevation Tour 3rd leg: North America". U2Gigs. Retrieved 12 August 2011. ^ "U2 Tour overview". U2Gigs. Retrieved 12 August 2011. ^ Gundersen, Edna (23 January 2005). "U2 tour has the concert business getting dizzy". USA Today. Retrieved 12 August 2011. ^ "Australiancharts.com – U2 – All That You Can't Leave Behind". Hung Medien. Retrieved 6 June 2014. ^ "Austriancharts.at – U2 – All That You Can't Leave Behind" (in German). Hung Medien. Retrieved 6 June 2014. ^ "Ultratop.be – U2 – All That You Can't Leave Behind" (in Dutch). Hung Medien. Retrieved 6 June 2014. ^ "Ultratop.be – U2 – All That You Can't Leave Behind" (in French). Hung Medien. Retrieved 6 June 2014. ^ "U2 Chart History (Canadian Albums)". Billboard. Retrieved 6 June 2014. ^ "Danishcharts.dk – U2 – All That You Can't Leave Behind". Hung Medien. Retrieved 6 June 2014. ^ "Dutchcharts.nl – U2 – All That You Can't Leave Behind" (in Dutch). Hung Medien. Retrieved 6 June 2014. ^ "U2: All That You Can't Leave Behind" (in Finnish). Musiikkituottajat – IFPI Finland. Retrieved 6 June 2014. ^ "Lescharts.com – U2 – All That You Can't Leave Behind". Hung Medien. Retrieved 6 June 2014. ^ "Officialcharts.de – U2 – All That You Can't Leave Behind". GfK Entertainment Charts. Retrieved 6 June 2014. ^ "GFK Chart-Track Albums: Week 44, 2000". Chart-Track. IRMA. Retrieved 6 June 2014. ^ "Italiancharts.com – U2 – All That You Can't Leave Behind". Hung Medien. Retrieved 6 June 2014. ^ "Charts.org.nz – U2 – All That You Can't Leave Behind". Hung Medien. Retrieved 6 June 2014. ^ "Norwegiancharts.com – U2 – All That You Can't Leave Behind". Hung Medien. Retrieved 6 June 2014. ^ "Oficjalna lista sprzedaży :: OLiS - Official Retail Sales Chart". OLiS. Polish Society of the Phonographic Industry. Retrieved 6 June 2014. ^ "Hits of the World - Spain". Billboard. Nielsen Business Media, Inc. 25 November 2000. p. 67. Retrieved 24 July 2017. ^ "Swedishcharts.com – U2 – All That You Can't Leave Behind". Hung Medien. Retrieved 6 June 2014. ^ "Swisscharts.com – U2 – All That You Can't Leave Behind". Hung Medien. Retrieved 6 June 2014. ^ "Official Albums Chart Top 100". Official Charts Company. Retrieved 6 June 2014. ^ "U2 Chart History (Billboard 200)". Billboard. Retrieved 6 June 2014. ^ "CAPIF - Representando a la Industria Argentina de la Música". archive.is. 31 May 2011. Archived from the original on 31 May 2011. Retrieved 13 November 2016. ^ "ARIA Charts — Accreditations - 2014 Albums". Australian Recording Industry Association. Retrieved 2 June 2014. ^ "Austrian album certifications – U2 – All That You Can't Leave Behind" (in German). IFPI Austria. Retrieved 5 October 2017. Enter U2 in the field Interpret. Enter All That You Can't Leave Behind in the field Titel. Select album in the field Format. Click Suchen. ^ "Ultratop − Goud en Platina – albums 2001". Ultratop. Hung Medien. Retrieved 13 October 2018. ^ "Canadian album certifications – U2 – All That You Can't Leave Behind". Music Canada. Retrieved 5 October 2017. ^ "Album Top-40: Uge 18- 2002". Hitlisten (in Danish). IFPI Denmark. Archived from the original on 29 September 2007. Retrieved 12 August 2011. ^ a b "U2" (in Finnish). Musiikkituottajat – IFPI Finland. Retrieved 5 October 2017. ^ "Gold-/Platin-Datenbank (U2; 'All That You Can't Leave Behind')" (in German). Bundesverband Musikindustrie. Retrieved 9 December 2017. ^ "Dutch album certifications – U2 – All That You Can't Leave Behind" (in Dutch). Nederlandse Vereniging van Producenten en Importeurs van beeld- en geluidsdragers. Retrieved 5 October 2017. Enter All That You Can't Leave Behind in the "Artiest of titel" box. ^ "New Zealand album certifications – U2 – All That You Can't Leave Behind". Recorded Music NZ. Retrieved 5 October 2017. ^ "Listy bestsellerow, wyroznienia — Pełny Tekst Regulaminu Przyznawania Wyróżnień" (in Polish). Polish Society of the Phonographic Industry. Archived from the original on 21 July 2011. Retrieved 12 August 2011. ^ "Polish album certifications – U2 – All That You Can't Leave Behind" (in Polish). Polish Society of the Phonographic Industry. Retrieved 5 October 2017. ^ "El post de las certificaciones en España: Todos los Oros y Platinos". AFYVE (in Spanish). AFYVE. Retrieved 24 July 2017. ^ "The Official Swiss Charts and Music Community: Awards (U2; 'All That You Can't Leave Behind')". IFPI Switzerland. Hung Medien. Retrieved 5 October 2017. ^ "British album certifications – U2 – All That You Can't Leave Behind". British Phonographic Industry. Retrieved 5 October 2017. Select albums in the Format field. Select Platinum in the Certification field. Type All That You Can't Leave Behind in the "Search BPI Awards" field and then press Enter. ^ "American album certifications – U2 – All That You Can't Leave Behind". Recording Industry Association of America. Retrieved 5 October 2017. If necessary, click Advanced, then click Format, then select Album, then click SEARCH. ^ "IFPI Platinum Europe Awards – 2002". International Federation of the Phonographic Industry. Retrieved 5 October 2017.